CHIANG RAI, Thailand — With thunderstorms and lightning threatening the sky here Friday night, pressure is mounting on authorities to save the 12 young boys and their soccer coach who remain trapped in a cave in northern Thailand, where they’ve been for more than 15 days. Time is of the essence since heavy monsoon rains could further flood the cave system as soon as this weekend, making rescue and the team’s survival even more perilous. None of the options proposed to save the team seem ideal. Speaking at a midnight news conference Friday, the provincial governor, Narongsak Osottanakorn of Chiang Rai, said that while the weather is crucial to extracting the team, there is still a narrowing window of opportunity for rescue efforts. 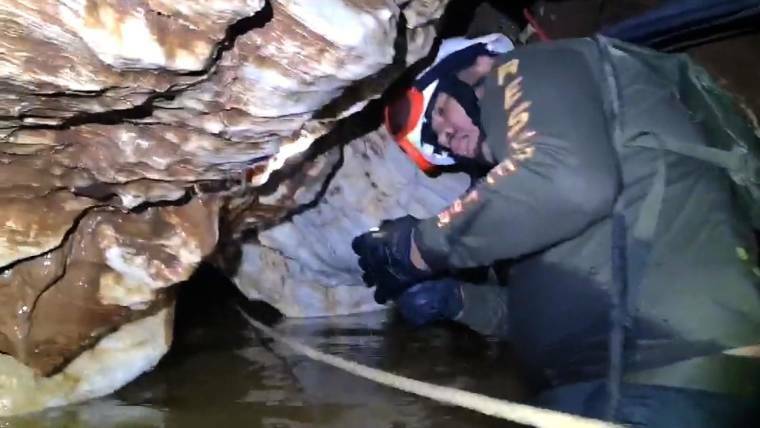 “Conditions are improving gradually within the cave, so we need to choose the most appropriate time to move,” he said. The boys, most of whom don’t know how to swim, were not strong enough to immediately attempt a dive, the governor added. 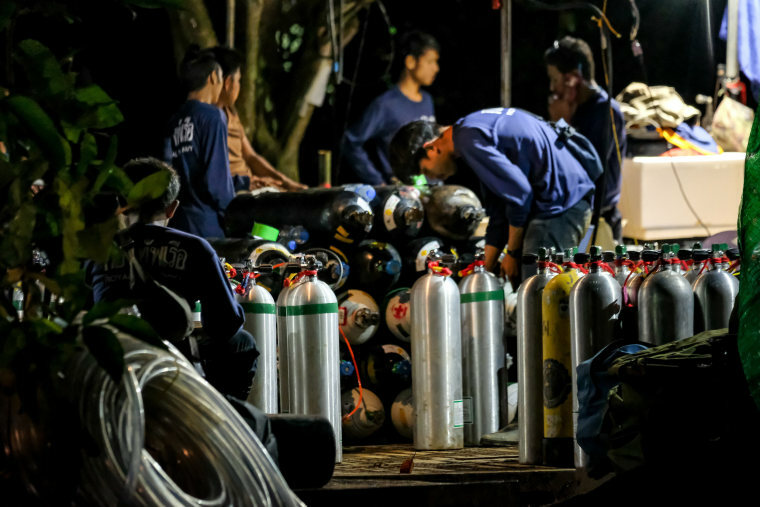 The preferred option of a rescue by divers was thrown into doubt after former Thai navy SEAL Sanam Kunan, 38, died after losing consciousness while returning from placing air tanks deep inside the caves. The air in the cave continues to be a source of concern, and the governor said late Friday that teams had successfully pumped in oxygen. “We’re checking oxygen levels every hour, and we’ve confirmed the oxygen inside is OK,” Osottanakorn said. Still, in light of the diver’s death on Friday and the ongoing struggles of the rescue operation, the mood was somber at the impromptu camp that has formed at the entrance to Tham Luang cave. About 500 rescue divers, first responders, officials and reporters milled around, many openly contemplating Kunam’s death and its implications for the plight of those trapped. The downbeat atmosphere wasn’t helped by the presence of thick dark clouds, which unleashed occasional heavy downpours. Inside the cave, sealed off from the camp by armed guards, the boys and their coach remain agonizingly far from safety, separated from the entrance by pitch-dark tunnels studded by stalactites and full of sharp turns and changes in elevation. Some of the narrower passages are so tight that divers are forced to remove equipment to squeeze through. The sound of helicopters beat through the air throughout the day as they circled the jungle-clad mountains on the border of Thailand and Myanmar where the cave is, scouting for holes that could be widened and used for a rescue. Soldiers from the U.S., Australia, Japan and the U.K. who have joined the rescue effort trudged stony-faced and silent through the muddy surroundings. Elon Musk said Friday that he was sending a team of engineers from SpaceX and The Boring Company to offer the Thai government help in evacuating the team. Another suggested recourse of resupplying the team with food and other essentials for as long as it takes for waters to recede seems to have slipped from favor. Doubts have been raised over how long the boys could cope mentally and physically with what could be up to four more months underground. With some of the boys malnourished after surviving on mainly snacks for the nine days it took rescuers to find them, speed is now imperative in getting the team out — especially with torrential monsoon downpours forecast for the coming days. “We thought they would be able to stay there for a while, but conditions have changed and we have limited time,” Yookongkaew said. As the sun broke through the dark clouds in the afternoon on Friday, divers involved in the rescue sounded a more optimistic note about the prospect of getting the boys out safely. While some believe the rain will make the diving option even less feasible, Miiko Naasi, a volunteer diver from Finland, argued that the opposite was true, that rain would help the children escape quicker. “Of course it is going to be hard for the kids to dive out, but conditions are better than ever right now,” said Naasi. Another diver, Ivan Karadzic, said the rescue mission could happen soon, adding that the boys only needed to learn some basic skills.